When considering serious acts of fraud and corruption, if it looks like a duck, waddles like a duck and quacks like a duck then it is a duck. Or in other words - this is how safe your house is when some lawyer comes along and demands Registers of Scotland hand over your titles. This should be taken as a warning against complacency on security of land ownership in Scotland. Sturgeon bleat away about everything is okay we just hand over the courts to the legal profession and cant be arsed to do anything about it!! Looks like they are doing a lot of nothing about it in all these documents!! Good work Peter as usual!! Don't worry Peter - We get it about Gill keeping quiet on the title thing! You should also be looking into the Justice Committee to see how many msps knew about it and did not bother to ask for fear of upsetting the judge! What did they do with the £58million? Anyone who has ever actually been to the Court of Session says it looks like a tip! Why is Nat Sturgeon covering up something which happened under Jack McConnell's Labour/LibDem Scottish Executive? Answer = Because she is a lawyer and it is just fine by her to give public buildings to lawyers along with a big suitcase filled of cash. Just imagine the nationalist outcry if former Scottish Exec handed over the rights to a hospital and ₤58m quid to a union. The SNP would be hounding for an investigation and we would never hear the end of it so why now the big cover up just to protect the faculty of advocates and where are the outraged msps while Sturgeon waffles on nothing can be done about it? The £6o million pound refurbishment was paid for by Taxpayers money, not by the faculty of advocates, and so clearly it is public property (i.e. held for the common good by Edinburgh City Council). No surprise to see certain msps, more than one lawyer among them I am sure, have sided with their cronies in the legal profession. Utterly disgraceful and reveals just how far the legal profession are being allowed to go in trampling over the rights of others. "SG - this was a courtesy meeting to hear what the concerns of CEC were as they had had difficulty finding somebody in central government to engage with." SG (Scottish Government) held the meeting in bad faith from the start.They never intended to change their position and as you say Scottish Ministers appear to be supporting the Faculty of Advocate's title to Laigh Hall. "Even more so if you take into account the land grabbers in this case – highly paid advocates clad in Victorian robes – who appoint each other as judges, prosecutors and the like, and debate ordinary folk’s lives, loves & rights as if they did not even exist – have the last say and last word on ‘justice’ and many aspects of politics and public life in what passes for ‘modern day’ Scotland." How did they manage to keep this a secret since 2006 even with all those involved in this mess? And more to the point why did Edinburgh City Council not speak out about this publicly until nine years later? Many questions here must be answered properly in a public forum..
"CEC - an elected member had triggered an examination of the Parliament House non domino title and CEC officials concluded that the title trail was mistaken and CEC had an interest still. They had examined titles from the 1550s, 19th century, 1905 Common good records, 1925 entry in registers etc." CEC being Edinburgh City Council I presume. From the quote I deduce the situation re title transfer of Laigh Hall was kept from the council's elected councillors until this was raised by Andy Wightman during his investigations. There is an important point to be made here - the councillor who held portfolio over buildings at the time must have been aware of the title transfer to ministers in 2005 and possibly signed off on dealings with the Scottish Executive. Why was this not discussed in public at the time? As an Edinburgh resident I recall not one mention in the press or by the council of this affair until now. I also find it staggering no one has bothered to question exactly what £60 million pounds has bought for the Scottish Court Service. Someone earlier described the buildings as "a tip".I agree! I have visited the court buildings many times to watch trials and hearings and believe me aside from papering over the cracks and door entry systems it has not changed all that much in the past twenty years.Certainly no changes looking like £60 million worth. On page 75 of the released documents there is a letter dated 10 May 2006 from Edinburgh City Council signed off by a Kathleen M Gibb "for Council Solicitor" stating Edinburgh City Council has no right, title or interest to any of the land Scottish Ministers were seeking to register and consents to the registration of Scottish Ministers title to Parliament House. Yes, bad faith from the start.Clearly it was on the mind of Scottish Ministers to hand over titles to the legal profession when they undertook the exercise to register the titles in 2005/06. It may not come as much of a surprise if it emerges elements of the legal profession suggested the move on the titles in the first place to gain the titles for their own interests as we now see did in fact occur, along with benefits from a multi million pound taxpayer funded refurbishment of Parliament House. Given that this Scandal has leaked out, should it now be incumbent on the Justice Committee to require Lord Gill to return to their committee to ask him when did he know about this double-dealing and why did he stay silent when he surely knew what had transpired was almost certainly fraudulent? With this shocking scandal we could reasonably ask the question are Scotland's MSP's actually in control at all or is Scotland being run by the Law Society of Scotland and the Faculty of Advocates, where they are not subject to the laws of the land? Has it not struck anyone else that this is just one piece of the jigsaw puzzle whereby the Scottish Government are selling Scotland's People down the river along with its democracy? This is but another element of what is becoming the steady creep towards a Private Judicial System, whereby democracy has no place and that a verdict is obtained by he who pays the most cash? After all we already have a Private Police Force in Scotland who are totally unaccountable to Parliament? Have to agree with you there is no sign to me £60 million improvements on a very out of date and out of purpose building. Perhaps the faculty of advocates are planning to evict the judges to a B&Q and run their own business from Parliament House? I did not realise judges owned the courts as well as sitting in judgement.Surely this is a horrendous conflict of interest.Courts must be owned by the state and judges must be impartial but how can they be impartial when they own the court itself and benefit from cases going on forever. You are quite correct on this one Peter - Lord Gill has some explaining to do on why he and his sidekick McQueen did not volunteer the information on the title switch to the Justice Committee. For msps to sit there taking evidence from Gill and McQueen on court closures and this enormous refit spend and not hear from either regarding the status of the court buildings is a matter which must be debated and Gill hauled back before the Justice Committee. Little wonder the Judicial Office refuse to issue any statement on the silence of their boss! I found the document you mentioned signed by the solicitor.I intend to take this up with my local councillor and will let you know what transpires. For the record a big thank you for posting all this material.Your blog is an incredibly valuable resource. I have often heard your name mentioned in the court of session leading me to search for this blog some years ago.I became a regular reader. So basically the council were asking for help and no one in the Scottish Executive wanted to play ball.Warning sign something was going on probably along the lines of what you said intentions were from the start as in hand over the entire courts to the Faculty/Law Society for where one is the other is not far away. 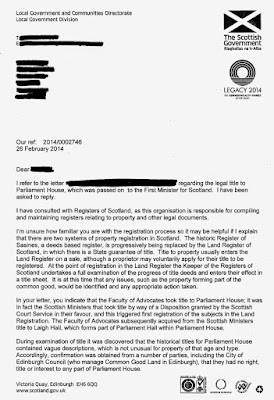 Land registration in Scotland is as corrupt as they come.Everyone knows it yet no one wants to address the problem - probably due to the piles of money and misplaced public assets such as your courts flowing into legal coffers. You might want to check and see how many other court buildings have fallen to the same giveaway clauses. All those prisoner vans in and out of the courts must have transported away the £60million! I am surprised so much was released to you via foi. Either someone at SG likes you (I doubt!) or a message is being sent to those involved in this story. Solicitors for CEC will be looking at this material as evidence should legal action commence. Anyone else spot the Millar Bryce report on Page 23? Is this what all these Scottish Government lawyers do all day? Try to bury bad news and millions thrown at lawyers while the rest of us make do with mortgages and food banks? I thought the SNP said they were different from Westminster .. NOT! I too am beginning to think this information was withheld from elected members of the council until recently. There should be a full investigation into what happened and who is to blame for the loss of Parliament House to Scottish ministers and the advocates who must now return the titles regardless of Ms Sturgeon's attempt to brush off the matter. A sensible business case decision to invest £65 million in buildings owned by the faculty of a*sewipes and an arms length organisation bent on handing over the rest to said faculty. I do not think so Mr McQueen and neither do you or Lord Gill otherwise you would have told the Justice Committee the entire story. I wonder what questions Chic Brodie would have asked if he were told during the hearing of the Parliament House land titles swindle. This has been kept from the public and must be investigated also support the return of the entire Parliament House titles to Edinburgh Council. I hope Andy Wightman puts in a public petition at the Scottish Parliament calling for a full investigation. Looks like a brewing scandal hope the newspapers give it more coverage than present. Just another good warning to outside investors do not bother buying property in Scotland or using Scots financial services.All are corrupt from legal banking land titles accounting and do not bother to deny because one look across the internet tells the truth about what goes on north of the border. So, could all of the closures of courts all over Scotland be another attempt to sell off land titles and buildings to convert it into cash to be fed upon by the Scottish lawyer cash sharks? All I can say is I am glad I do not own any property in Scotland. Headlines in yesterday's Sunday Herald re Edinburgh Council may give you some clues as to why the Parliament Hall giveaway was never openly discussed..
Where would we be without Public Service journalists at the Diary of Injustice? amazing Sturgeon just stands there and gives a recital from the legal profession - and nothing can be done about it according to her.If the council are taking legal action I hope they call Sturgeon as a witness. A Policeman I started chatting to at the High Court told me the real criminals work inside the courts and he said he reads your blog!How do you feel about that? Why was it allowed to go on for as long do you know? Anyone with sense will read it and steer very clear of Scottish financial and legal business. C'mon the Police, where are you? Good FOI and Sturgeon is hilarious in that clip! No No No we cant recover it from the Faculty of Advocates impossible no chance! Why is it always No when it comes to lawyers and the legal profession?? Beginning to get a bit stale every time some lawyer scoops up assets for himself the answer is always No No No from Sturgeon and the Law Society!